ATTENTION!!! Please be aware that the sharp rises and drops in the graphs displayed for some of the Allegheny River gages are being caused by hydroelectric power producers passing relatively large amounts of streamflow. LOCATION.--Lat 40`49'13", long 79`31'54", Armstrong County, Hydrologic Unit 05010006, on right bank 600 ft upstream from dam at lock 7 at Kittanning, 5.7 mi upstream from Crooked Creek, 9.7 mi downstream from Mahoning Creek, and at mile 45.8. PERIOD OF RECORD.--August 1904 to September 1928, October 1934 to current year. Monthly discharge only for some periods, published in WSP 1305. GAGE.--Water-stage recorder, heated tipping bucket precipitation gage, and concrete dam control. Datum of gage is 773.40 ft above National Geodetic Vertical Datum of 1929 (U.S. Army Corps of Engineers bench mark). Prior to Sept. 30, 1928, non-recording gage at site 4,000 ft downstream at different datum. Oct. 1, 1934 to Apr. 19, 1939, non-recording gage, Apr. 20, 1939 to Sept. 27, 1990, water-stage recorder at present site at different datum. Satellite telemetry at station. COOPERATION.--Station established and maintained by the U.S. Geological Survey. 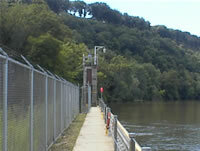 Funding for the operation of this station is provided by the U.S. Army Corps of Engineers, Pittsburgh District, the Pennsylvania Department of Environmental Protection, and the U.S. Geological Survey. REMARKS.--Sharp rises and drops in discharge during periods of low flow may be caused by hydroelectric power production. Flow regulated since 1924 by Piney Reservoir, since December 1940 by Tionesta Lake (station 03019500), since June 1941 by Mahoning Creek Lake (station 03035500), since November 1949 by Chautauqua Lake, since June 1952 by East Branch Clarion River Lake (station 03027000), since October 1965 by Allegheny Reservoir (station 03012520), since July 1970 by Union City Reservoir (station 03021518), and since January 1974 by Woodcock Creek Lake (station 03022550). Supplied by NWS: Action stage-17 ft; Flood stage-21 ft; Moderate flood stage-22 ft; Major flood stage-23 ft.